This YA novel is about a girl being physically abused by her boyfriend, and how she gets sucked into believing it is her fault. Not only that, but Betts also blows off her best friend Jo because she wants to be with Aiden. There's a real challenge in getting the right balance in narration, since Betts, who tells her own story, has to be a sympathetic character, but also in some ways has to be seen to lack judgment or lose control of her own actions. She is a high school senior and Aiden is older than her, so she is soon on her way to college. Indeed, she is going to a highly rated school, so she is smart. Yet she makes bad decisions. Aiden is cute and charismatic, but he also is very jealous and controlling. Once she is in the relationship, he gets physically abusive, but he apologizes after, and she forgives him. She feels that she has a much better connection with him than she has with anyone before, so she is willing to go against her better judgment. 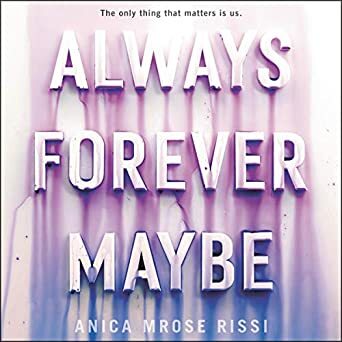 Author Anica Mrose Rissi does manage to make Betts smart and independent in most of her life, and she gives Betts a major blind spot when it comes to Aiden. The story has a few other elements: Betts parents are quite strict. Her best friend Jo is a lesbian and is searching for a girlfriend. Aiden's mother had cancer but recovered, and she left the family making him very resentful. Betts works at a candy store and the girl who also works there has a boyfriend who Betts likes a lot. But not a whole lot happens in this story, and most of the plot revolves around fairly ordinary events that occur in senior year of high school. There's a bit more frankness about sexual matters than you find in most YA literature. The best feature of the story is the strength of the friendship between Betts and Jo. This becomes challenged at one point but it is what solves the relationship problem that Betts experiences. It is somewhat illuminating about abusive boyfriends and how they manipulate their partners. The unabridged audiobook is performed by Brittany Pressley, who is good with different voices for the various characters, and who makes Betts a sympathetic narrator.